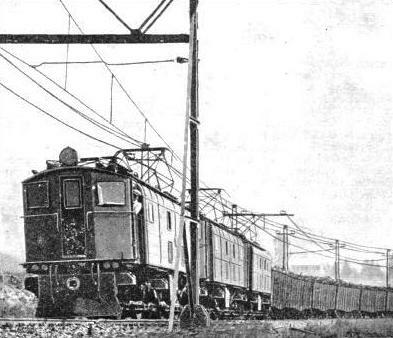 PASSENGER AND MAIL TRAIN on an electrified section of the railway in Natal. 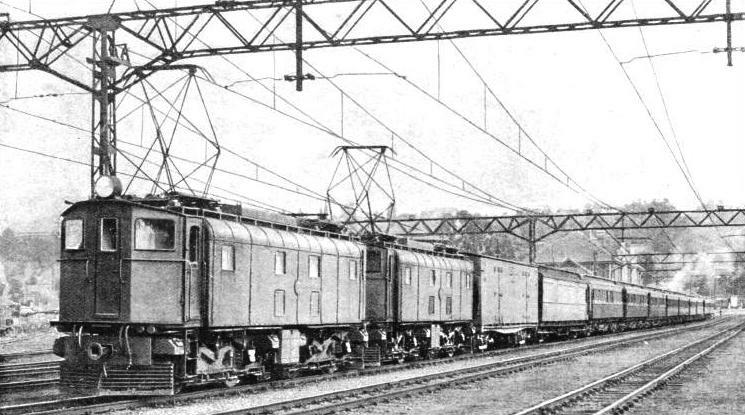 Electrification of sections of the South African Railways was begun in 1923, the first stretch to be converted being 171 route miles in Natal, between Glencoe and Pietermaritzburg. THE Natal section of the South African Railways and Harbour Administration constitutes the longest electrified main-line railway in the British Empire overseas, and is among the most important examples of goods traffic electrification in the world. 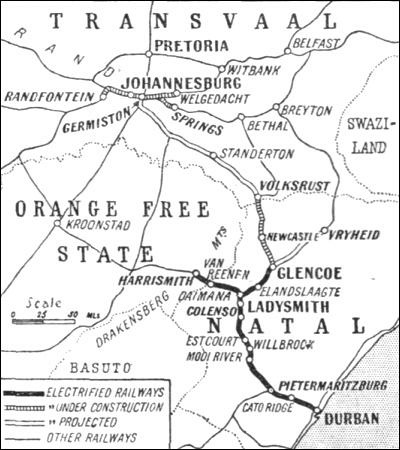 In 1935 the forty-five miles section from Durban to Cato Ridge was due to be completed, bringing under electrical operation the whole main line from Durban to Harrismith in the Orange Free State (via Ladysmith and Daimana Junction), and from Daimana Junction to Glencoe, in the direction of the Transvaal. Meanwhile, electrification work has already started from Glencoe northwards to Volksrust, in the Transvaal. The Glencoe-Volksrust section is important because it contains the iron and steel town of Newcastle, and because there are new coal-fields which are being developed to the north of Glencoe. The electrification of the Natal Railway is, as will be seen later, bound up with the development of coal traffic - a fact which may appear strange to those who have not studied the technique and economics of electric traction and who might, perhaps, expect that a railway which exists to handle coal should also burn coal in its locomotives. THROUGH RUNNING with electric trains is planned between Durban and Johannesburg, a distance of some 485 miles. This map shows the position of electrification at the present time. The extension of electrification from Glencoe to the Transvaal frontier has an added importance in view of the recently announced decision to convert 223 track miles of railway in the neighbourhood of Johannesburg to electrical operation. This scheme, for which £1,000,000 have already been voted, and on which work has already begun, includes the line running roughly west to east from Randfontein via Johannesbuig and Germiston to Springs, and the line from Germiston to Welgedacht. These seventy-four route miles contain numerous junctions, and carry the dense passenger traffic of the Johannesburg area and, of course, the heavy mineral traffic. Germiston is the junction of the northern Transvaal lines with the line running south-east to Volksrust. Hence it is clear that the next step will be the electrification from Germiston to Volksrust. This will provide through running on electric tracks from Johannesburg to Durban, a distance of about 485 miles. 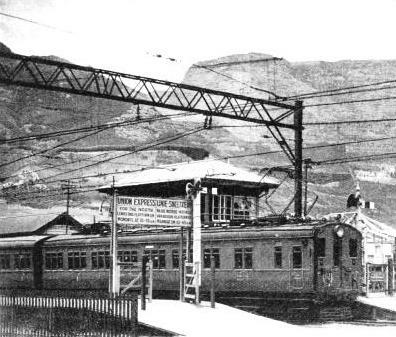 Electrical operation on the Natal railway from Glencoe to Pietermantzburg was put in hand in 1923. It is not until the gradients between these towns are studied that it is realized, first, why electric traction had to be adopted on the Natal Railway (which has a relatively low traffic density), and secondly, why work began from north to south and not from Durban, the outlet of Natal, northwards. THREE 3,000 VOLT LOCOMOTIVES, each of 1,200 hp. All classes of electric trains on the Natal Railway, whether freight or passenger, are hauled by 1,200 hp units. The locomotives are arranged for use in multiple, and are fitted with couplings strong enough to make possible the operation of four locomotives from one cab. Glencoe is the centre of the Natal coalfields, and a large proportion of the traffic south to Durban is coal for export (ship coal in large part), The fact that it pays to bring this coal 240 miles to Durban is due partly to the fact that the coal mining is surface mining, and partly to the cheap railway rates and efficient service. The railway has a hard task to perform. Glencoe is 4,310 ft above sea-level. From here the line falls to 3,190 ft near Colenso, the scene of the fierce battle in the South African War of 1899-1902, and to-day the site of the power station which supplies the Natal railway. From Glencoe to Colenso the railway passes Elandslaagte and Ladysmith, also famous in the war. From Colenso to Estcourt, a distance of about twenty miles, the line rises again to 3,830 ft, and thence to a summit-level of 4,980 ft over a pass in the Drakensberg Mountains, which rise to about 11,000 ft. From this point, which is near the town of Willbrook, to Pietermaritzburg the distance is about sixty-five miles, during which distance the railway falls to 2,210 ft. From Estcourt to Mooi River (about thirty-five miles) there is a ruling gradient of 1 in 65. The average speed of steam traction here was 8 mph; that of electric locomotive trains is 21 mph, with slightly higher speeds in anticipation. The railway route from Glencoe to Pietermaritzburg is 171 miles; as the crow flies the distance is only 100 miles. The sharpest curve on the line is of 300 ft radius, and there are many curves of 573 and 716 ft. About one quarter of the track mileage has a radius of 1,100 ft or less. HAULING A HEAVY COAL TRAIN up a 1 in 65 gradient on the Natal Railway. Between Glencoe and Pietermaritzburg freight trains of 1,500 tons hauled by three electric locomotives coupled together - as above - cover the distance of 171 miles in 101 hours. It is interesting to examine the results of electrification on this section. Before electrification the maximum tonnage moved south of Ladysmith, making the fullest possible use of steam traction, was 25,351 tons. The General Manager’s report tor 1926 stated that the ninety-five locomotives then in service were capable of hauling 40,000 tons between Glencoe and Pietermaritzburg, and that they had in fact hauled 34,000 tons. Before electrification it was impossible to run a 1,000-tons train the full distance of 171 miles. A time schedule between Glencoe and Pietermaritzburg was 16½ hours, hauling 1,000 tons from Glencoe to Ladysmith, 820 tons from Ladysmith to Mooi River, and 850 tons from Mooi River to Pietermaritzburg. To-day a train weighing 1,500 tons and hauled by three locomotives does the total distance in 10¼ hours. The three locomotives are coupled together and driven from the front driving position by one driver. The saving in wage-bills was an important consideration in deciding upon the economics of electrification. The new service was worked by eighty-five sets of drivers and their mates, who replaced 300 drivers and firemen. This saving was augmented by a large reduction in overtime. The total mileage worked by ninety-five electric locomotives in 1927 was 6,383,000, making an average per locomotive of 67,000. The average cost of maintenance was 1.88 pence per mile. It was further estimated that the total capacity of the line had been increased by sixty per cent. There are two routes between Pietermaritzburg and Durban, of which the newer, with its 1 in 66 gradients, as compared with 1 in 33 to the north, has been chosen for electrification. The work of electrification between Cato Ridge and Durban has necessitated the doubling of the track, and the laying of the second track - on the standard South African 3 ft 6-in gauge - through ten tunnels, as well as the construction of long stretches of cutting and embankment through difficult country. The Glencoe-Pietermaritzburg section of the Natal Railway was opened to electrical operation in 1925. The Pietermaritzburg-Durban section was due to come into operation in 1936, and work is proceeding on the northern section of the Natal Railway from Glencoe to Volksrust. MONUMENT STATION, at Cape Town, on the electrified suburban lines. The scheduled average speed of the suburban trains is twenty-two miles an hour. inclusive of numerous stops. There are two other stretches of railway which are of obvious importance - from Glencoe to Vryheid, and from Daimana Junction to Harrismith. The electrification of the first of these sections has been authorised but postponed; that of the second was completed in 1934 Daimana-Harrismith is the route connecting Durban with the Orange Free State, and, apart from longdistance traffic, there is also a heavy mineral traffic load. The distance from Daimana Junction to Harrismith is sixty miles. Between Daimana and Van Reenen, on the Orange Free State border, the line rises 2,236 ft in thirty-five miles. The electrification of this section included that of the goods and railway yards at Daimana Junction. The locomotives used on this Natal line are of particular interest. All classes of service, whether freight or passenger, are hauled by 1,200 horsepower locomotive units. These units are arranged for use in multiple, and are fitted with couplings of sufficient strength to allow four locomotives, if necessary, to be operated in multiple from a single cab. The main power equipment of each locomotive unit consists of four traction motors designed to work at 1,500 volts and coupled, two in series, across the 3,000-volt supply line. At average line volts (about 1,350 per motor) they have a rated output of 300 hp, at 1,500 volts they are capable of producing about 340 hp. They are controlled by a number of electro-pneumatic unit switches and cam switch groups, arranged tor connecting the motors in series or parallel, also for reversing and for field control. Four economical speeds are obtainable, and regenerative braking is provided for and continually employed. The body of the locomotive is divided into five compartments consisting of a driving cab at either end, two auxiliary machinery compartments adjoining these, and a high-tension chamber in the centre ot the body. Each driving cab contains all the necessary control gear, meters, gauges, brake valves, and so on, with which to control the locomotive. The two cabs are connected by a corridor running along one side of the locomotive. ON THE CAPE TOWN SUBURBAN LINE, a train at Monument Station. 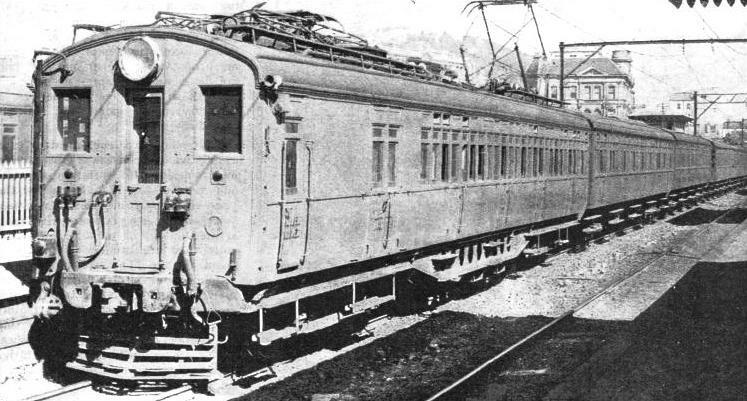 Electrical operation of trains from Cape Town to Seapoint began in 1927, and from Cape Town to Simonstown in 1928. Overhead electrification at 1,500 volts DC was adopted. In the background of the illustration is seen part of the world-famous flat-topped Table Mountain. The machinery compartments between the central high-tension chamber and the driving cabs contain two motor-generator sets, one 16 kW and the other 28 kW, each with a blower fan on its shaft for ventilating the main motors. In addition there are one compressor, one exhauster, air reservoirs for the brakes, low-tension control apparatus for the auxiliaries and battery, together with contractor gear for controlling the field of the 28-kW motor generator. The battery is mounted in cases hung underneath the locomotive body. Sections of the roof above the auxiliary compartments and the high-tension chamber are easily removable to enable heavy machinery or control gear to be lifted out for repair. The Natal electrification is claimed to be the first in which regeneration was used extensively with coupled locomotives. The system has proved completely satisfactory. The main object of regeneration on the Natal Railway is not so much the saving of coal which may be effected, as to enable a higher speed to be attained on down grades. The ordinary braking system can thus be held in reserve. 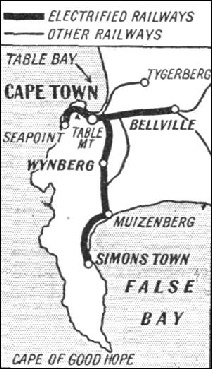 THE ROUTES of the electrified lines around Cape Town. Power for the suburban lines is derived from a specially constructed power station at Salt River, two miles east of Cape Town. In addition to this long and important main line electrification, the South African Railways and Harbour Administration operate electrically the Cape Town Suburban Railways. The transport problem of Cape Town is, for geographical reasons, a peculiar one. Cape Town itself is built on a comparatively small area between Table Bay and the almost vertical face of Table Mountain. Outside the city site, building has been still further limited by the rocky nature of the district, so that the suburbs of Cape Town, with their daily travelling population, are restricted to a narrow strip of country along the side of the mountain between Cape Town and Wynberg, and to the area between False Bay and the mountain extending from Muizenberg to Simonstown. This area lies between fifteen and a half and twenty-two and a half miles from Cape Town. The former steam service was efficient, but it became clear in 1925 that the increased traffic necessary to make the Cape Town lines pay would outstrip the capacities of the service. Electrical operation from Cape Town to Seapoint began in 1927, and from Cape Town to Simonstown in 1928. Overhead electrification at 1,500 volts DC was adopted, and power is taken from a specially built power station. 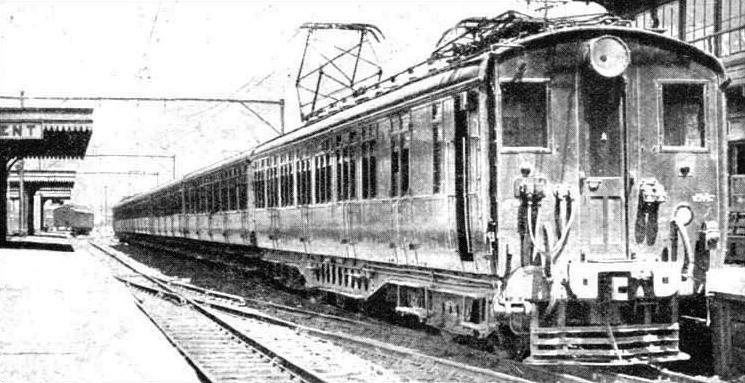 LOCAL TRAIN on the Seapoint route of the Cape Town electrified suburban lines. Motor coaches on this railway are equipped with four motors with a one-hour rating of 187 hp connecting in pairs in permanent series. The average train consists of two motor and three trailer coaches. You can read more on “The Cape Town to Johannesburg Express”, “Developments in South Africa” and “Electrification Overseas” on this website.